The Mitchell Library Printed Books collection contains photographs of H.M.S. 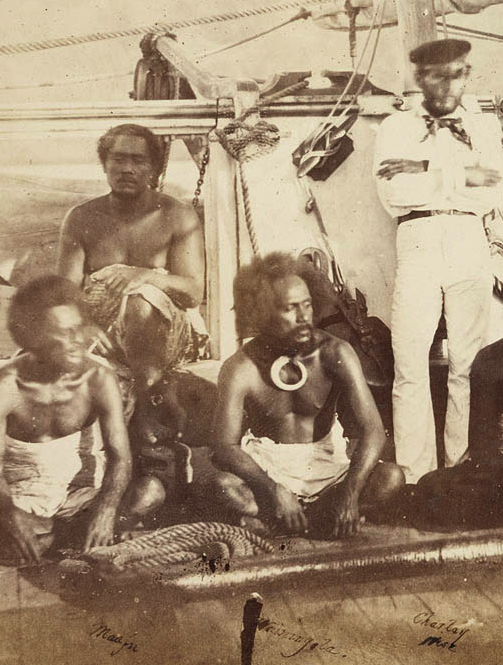 Pelorus and crew members, including portraits and views taken in Fiji, New Hebrides, New Zealand and Norfolk Island, ca. 1860-1861]. The captions are not explicit; but the photos give extra details as names were written on the image in ink. For example Conference, Fijian and Tonguese chiefs on bd. Pelorus, at Mathuata, Vana Leon, Fiji. (search this blog for “Maafu” to see the left hand side of this photo). (Consul Pritchard seated at right) shows Charley (Msk?) and Ritora. Consul Pritchard, – a weedy fellow – with administrative ability – was a land-dealer. For example, he bought the island of Vanutha Lai Lai from Thakombau, and in 1862 sold the island to Thomas Johnston Thompson, an English trader. Thompson – from Sunderland, England, built sailing ships in Invercargill, and traded in the islands using the the island as a base. 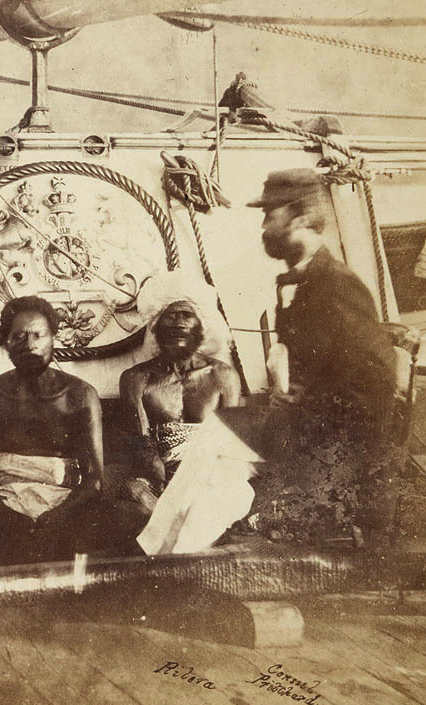 Some of his barques and schooners – built in Invercargill, New Zealand – were later used for the slave trade. His German wife, Christiania Gotze lived on the island with some of her 13 children. More than half died as infants; and four were baptised at Levuka in April 1862, by John Calvert, the Methodist missionary in control of the Ovalau circuit. One of those children had Pacific genes – (perhaps Tongan – as some from that line, look rather like Maafu) . Family letters tell she “slept with an axe under her pillow”, and had experienced unmentionable experiences. She left the island and “escaped over a causeway”, with the children, after a violent event on the island. No birth certificate exists for that child – Christiane Thompson; who went on to found a Pacific dynasty in New Zealand. The author of this blog descends from that line.